In order to secure his place in one of the military formations that will march in front of Tiananmen Square on September 3, Liu Zhaowei, a 23-year-old soldier from Shandong Province has pushed himself to the limit during training. "It might be my only chance to be in this kind of parade. I must cherish it and have no regrets," Liu said. 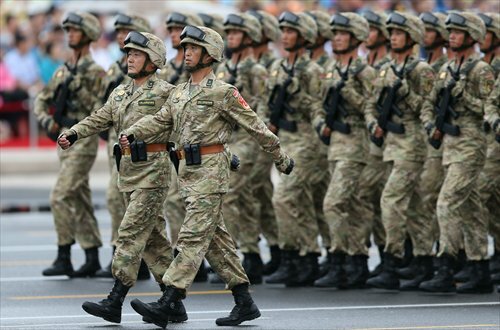 Liu is one of the more than 10,000 servicemen and women who will march past the symbolic Tiananmen Rostrum in the heart of Beijing along with about 500 military vehicles and nearly 200 aircraft in the military parade on September 3. The parade will mark the 70th anniversary of the end of World War II and China's victory over Japan. Units which were ordered to participate in the parade soon selected their best soldiers and started training in their local bases, then later came to Beijing for group training from June 10 onwards, Wang Shun, deputy chief of staff of the Beijing Military Area Command and parade command deputy director was quoted as saying by the Beijing News daily. According to Wang, the training is demanding as soldiers need to meet high standards in a limited time. "The heads, hands, guns, legs, and hats of each line of soldiers must be level and the formation must have a clear transverse line, vertical line and diagonal line," said Liu Shixu, senior colonel and a chief coach of one of the 50 formations taking part in the parade, was quoted as saying by the Xinhua News Agency. More than 100 servicemen above 1.75 meters in height have been chosen as members of the artillery salute team and they need to practice their movements 1,000 times every day in order to fire the salute in a neat and uniform way, Zu Dongge, leader of the artillery salute team was quoted as saying by news portal, chinanews.com. Wang Shun told China Central Television (CCTV) that soldiers have been asked not to blink as they pass the Tiananmen Rostrum as it ruins the impression of uniformity if one of the 25 soldiers in a line blinks. The best-performing troops will be placed at the front of the formation and any mistake in training can cost a soldier his place in the formation, according to Liu, who once was taken out of the formation for making a mistake. New technologies have been adopted during the soldiers' training to better prepare them for the parade. For example, the Beidou Navigation Satellite System, a domestically-developed GPS, was used to improve precision and timing. Wang Shun said that Beidou's automatic timing system was used in the training of all units and has helped them meet the high standards expected of them. Wang said that Beidou was used to create a simulation of the parade and streamline its design. In addition, high-speed digital cameras were used to film formations and monitor the performance of each soldier. "With these photos, we can easily see who kicks his leg too low and who raises his head too high. We can spot weaknesses and correct them as early as possible," said Liu Shixu. Fan Hui, leading officer of a navy formation, said lasers have been installed on vehicles so that they can keep a set distance from one another. After working hard for two weeks, Liu came back to the formation. Liu and his teammates are working overtime in the last few days before September 3 and await the inspection of the people of the country.